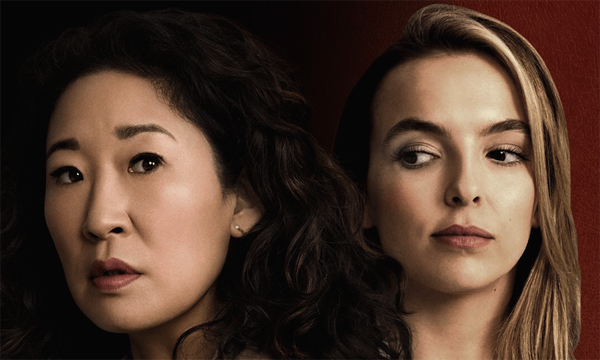 Now that season one of BBC America's Killing Eve has finished, LET'S TALK ABOUT IT! I won't spoil anything on the main page, because I didn't know a thing about it going into episode one, and that made it all the more spectacular for me. I hadn't even heard of it when a friend I've known since high school recommended it. Her recommendations are always on point, and this was no exception. I LOVE IT SO MUCH. I watched the first 20 minutes of the first episode, then turned it off and waited until Iain got home so we could watch it together, because I knew he'd love it, too. We binged all 8 episodes of the first season over a couple of nights. And we couldn't stop screaming at each other about how amazing Sandra Oh is. "I KNOW! SHE IS SO GREAT!" "SHE IS VERY TERRIFIC AT ACTING!" "HAHAHAHA I CAN'T EVEN DEAL WITH HER SHE IS AMAZING THIS SHOW IS AMAZING AHHHHHHHHHHHH." Although Sandra Oh was the real standout for both of us, obviously we loved Jodie Comer (ALSO AMAZING) and everyone else in it, because the cast is incredible. And I had to keep pausing it to exclaim things like, "I just watched an extended scene of two spies talking about an assassin AND THEY WERE ALL WOMEN." I also loved Villanelle's sardonic mockery of Konstantin. (Really her sardonic mockery of anyone and everyone, but especially Konstantin.) The pretend pouting was always something to behold. Whew! The only major weak point in the show for me is the relationship between Eve and her husband Niko. I didn't really understand their relationship. I could never get my head around how she felt about him. Maybe that was deliberate; maybe we're supposed to feel like Eve isn't sure how she feels about him. But it felt too nebulous for me to grab hold off, and always felt like a bit of a waste for that reason. I wouldn't have missed it if we'd not gotten a glimpse of Eve's marriage at all. Anyway! Did you watch it? What did you think?